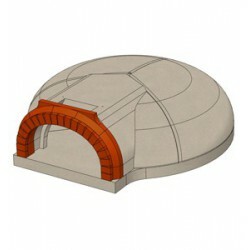 Pizza oven with a baking space of 0.83 m² , a real pro! oven, vault and floor insulation (a 63 mm thick mineral wool) and floor insulation (a 63 mm thick mineral wool) and floor with a 8 cm thick vermiculite mixed with cement, flue connector Ø 155 mm with a damper, insulating door, grout, use and assembly instructions. This oven is not available with a brick vault.